Being an enormous bird lover, this both warms my heart, then immediately makes me worry for her and her chicks' safety!! Hope they're OK, thanks so much for sharing all of this loveliness!! I know what you mean! She usually lays her eggs inside the box-house that she is actually up against, but for some reason she lay this lot outside against the wall of it! She's had many clutches, but only produced 4 live babies, one of which they all pecked to death (that was horrible, made me look at the quails in a totally new way!) but apparently that is the way of cage life, so now we just keep a really close eye on them and if they look like they are going to ostracize another bird we rescue it before they have a chance to cause any damage! 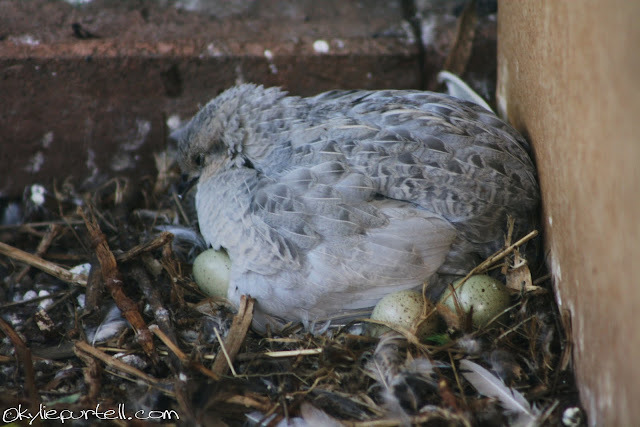 That brings back memories, when we had quails our silver mothers once laid 17 egg between them and 14 of them hatched - we ended up having to put the babies and mums into a separate cage as the males and non-breeding females were always pecking them.